Create a classroom wish list for needed school supplies! 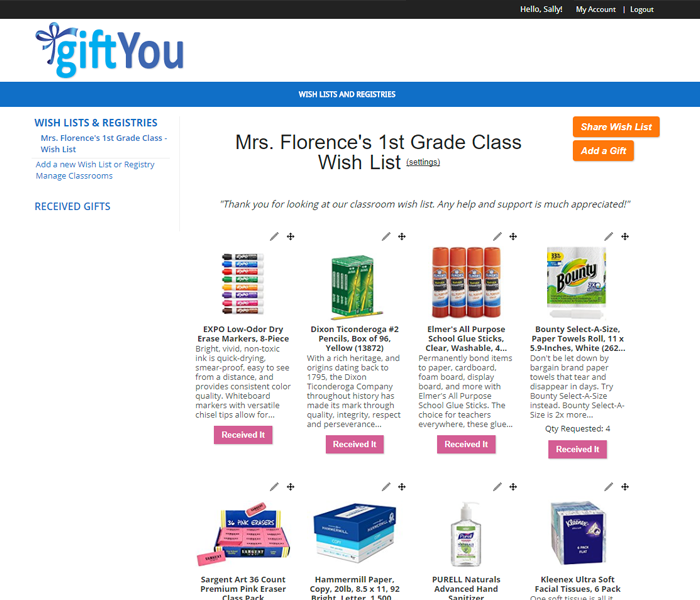 giftYou makes it easy for teachers or room parents to create a classroom wish list. Add any needed supplies, and parents can purchase them directly to help! Best of all, giftYou is 100% free! We keep track of everything in one place, eliminating multiple wish lists and preventing duplicate purchases! Easy to use for both teachers and parents. giftYou is a participant in the Amazon Services LLC Associates Program, an affiliate advertising program designed to provide a means for sites to earn advertising fees by advertising and linking to amazon.com. Amazon and the Amazon logo are trademarks of Amazon.com, Inc. or its affiliates. giftYou is a participant in other affiliate advertising and marketing programs that pays advertising fees to sites that advertise and link to their associated websites.